In these first days of July, I am struck with the reality of my time here in Palestine juxtaposed to my family and fellow Americans celebrating Independence Day. While my native USA just had a weekend of festivities celebrating independence, with most celebrating the joy of freedom, abundance, liberty and the ongoing progress of expanding justice, dignity and human rights, my hosts here in Palestine continue to live under Israeli Military Occupation and subjugation. 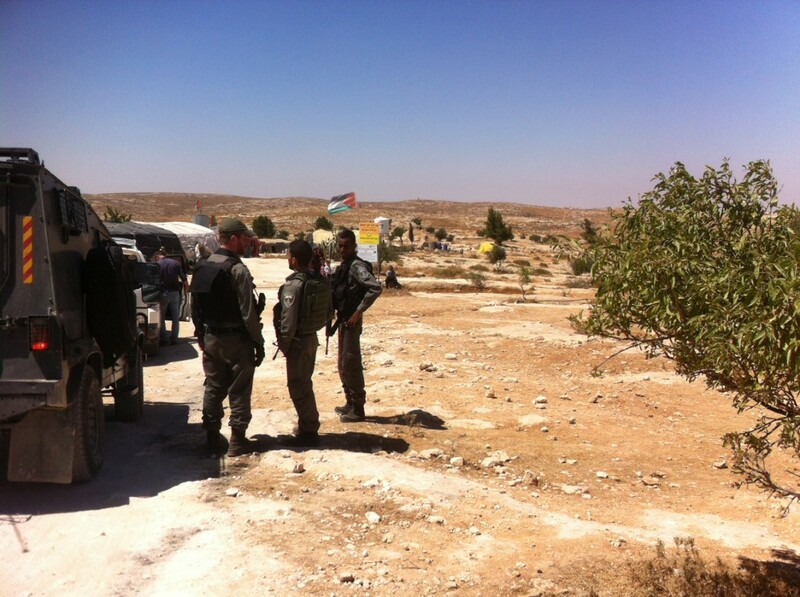 On July 7, a military transport carrying five soldiers accompanying the DCO (Israeli District Coordination Office) arrived in the center of Susiya and all walked through Susiya documenting and photographing various structures. As residents tried to engage with the soldiers and DCO, all communication attempts went ignored as if the village residents did not exist. All this is the precursor to what is believed to be an imminent demolition. The nearby bulldozers fired up their engines and were driven about by soldiers. Yet, no demolition has begun. 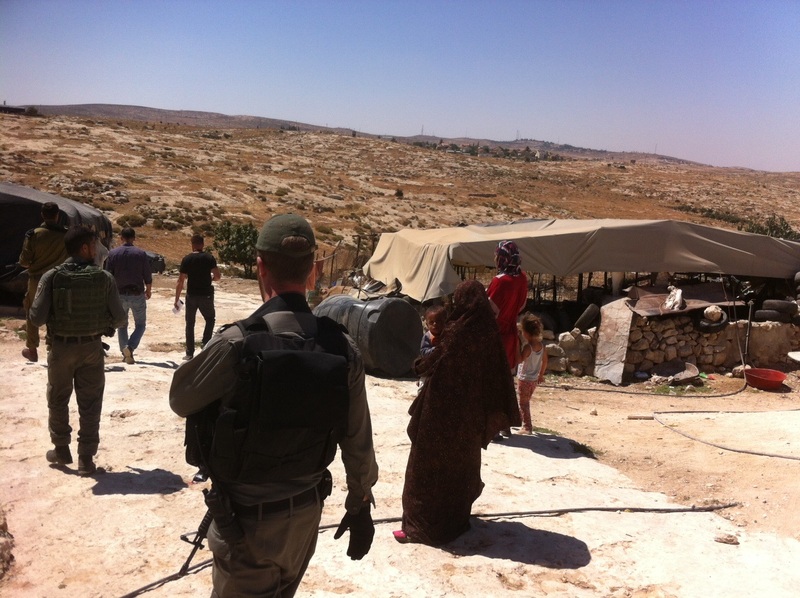 For the residents of Susiya, the elevated tension is palpable and the show of power by the Israeli Military is threatening and intimidating. This psychological dance amplifies the reality of living under Military Occupation and the psychological fear one has when the safety of family and home is never secure. This coupled with shortages of freedom, dignity and the most basic of human rights of water, electricity, sanitation, food, freedom of movement, and access to education demands that the Israeli Occupation of Palestine must end. Living with all things “Under Military Occupation” burdens ones heart, one’s soul, one’s life. My heart breaks, my heart cries for the struggle, the struggle for all here in this land, Palestinians and Israelis alike, Muslims, Jews and Christians all living in struggle in differing levels of intensity. I believe that this conflict, this occupation and subjection of another’s land and life is eroding the soul of all. The mistrust, the anger, the terror and aggression, all silently eat away at the moral and ethical nature of what it means to be human. Recently, President Obama spoke of America’s Original Sin when delivering the eulogy at the memorial for Rev. Clementa Pinckney in South Carolina. I understand the Original Sin of which Obama speaks as a reference to Nation Building on the backs of those the nation has subjugated. I believe the USA as a nation is creating distance in redemption of that Original Sin when the USA supports Israel’s ongoing occupation of Palestine by providing Israel with $3.1 billion in aid for fiscal year 2015 (Congressional Research Report, US Foreign Aid to Israel, June 10, 2015, www.crs.gov RL33222 ). Israel is nation building through the subjugation and ongoing occupation of Palestine. What the USA finds abhorrent in its own history, the subjugation of a people, we support in Palestine and Israel by the ongoing economic support for Israel’s Military occupation and Israel’s building of illegal settlements for its citizens to live in inside Palestinian territory. Here in this land, the light of hope is kept shining through public witness and presence on the ground and through the ongoing commitment to advocating for a just peace. Rev. David Etherington is participating in a program with Church World Service as an Ecumenical Accompanier serving on the World Council of Churches’ Ecumenical Accompaniment Program in Palestine and Israel (EAPPI). The views contained herein are personal to him and do not necessarily reflect those of the sending organization, CWS, or the WCC.